⇒ Provide a comfortable environment for your customers and your employees. 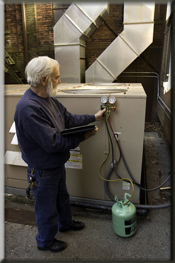 Whether you are the business owner, the building manager, or the person accountable for maintaining your company’s air conditioning system, having routine inspections of your air conditioning system will save you time, money, and the hassles of dealing with emergency maintenance procedures. We tailor your agreement specifically to your needs. Call us today at 845-278-1990 to discuss how you would benefit by having our experienced technicians set up a regular equipment inspection schedule.